Believe it or not, I am still working my way through leftovers from my fish taco dinner party last week. 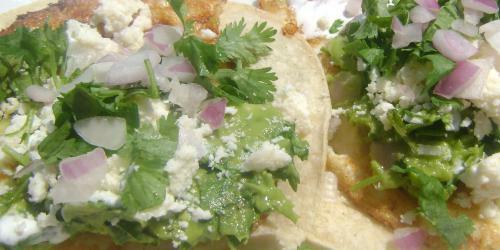 Corn tortillas, avocados, cotija cheese, Mexican crema, and cilantro abound in my refrigerator. Since a key element in being a successful BrokeAss in the kitchen is turning leftovers into culinary masterpieces, I relished creating this alternative to the breakfast burrito. All you need is a little cinnamon coffee and some friends for the ultimate breakfast fiesta. Note: if you want to add additional protein, fry a little crumbled chorizo (veggie or regular) to add to the tacos. 1/8 cup crumbled cotija cheese or shredded jack cheese $3 for 4 oz. Heat olive oil in a large frying pan over medium-high heat. Cook eggs to desired done-ness (I prefer over-medium, as over-easy results in a very runny taco). Heat a dry frying pan over medium-high heat. Warm tortillas until pliable and hot. Arrange on plates. Mash the avocado in a small bowl. Add the jalapeno, garlic, and half of the onion and half of the avocado. Season with salt and pepper to taste. To assemble tacos, place a cooked egg on each tortilla. Top with the guacamole, a little sour cream or crema, cheese, onions and cilantro. Pass a bottle of your favorite hot sauce at the table for those who like it extra-spicy. good the software after it offers been set up and choose “Open” from the list (this want just become carried out once).nice. good Employing FireStarter you can generate Kodi unveiling by easily two times tapping the Residence option on your Flame Television set private,nice. me and good work. Thank you for the information. good Yes, Players do not such as any disruptions while playing their much-loved games. Well, nowadays, any person can play and check	nice. good Although hassle-free, this is an inefficient technique of control, as the system might not really have to be restored at these periods. To make sure that you only	nice. You likewise can use these sites to obtain back-up of the apps Get it on Laptop and also maintaining them so that one could deploy the apps.